Notes: Based on a manga by Anzai Nobuyuki. After saving a girl from a near fatal accident, brash young ninja-obsessed teenager Hanabishi Recca is wounded. 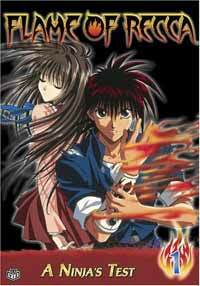 Recca begins to realize that there are powers in this world beyond normal understanding when the young woman he saves uses a form of mystical healing to help him. Declaring her his "princess" he pledges to protect her. It seems that she will not be his only unusual encounter as soon a mysterious woman with a less benevolent form of mystical power arrives and seems interested in attacking Recca. With elemental powers he didn't even realized he had, the young man is forced to defend himself. Soon, Recca will find himself swept up in intrigue linked to events over four centuries ago. I'll always have a vague bit of positive nostalgia for this show because it was the first time I heard the phrase, "Even Buddha gets angry after the third time." Who says shonen fighting anime can't be educational? Anyway, I'm not known for my particular fondness for fighting shows, but depending on how imaginative they are, I can find them very entertaining anyway. Flame of Recca starts out with an interesting variation on the fighting genre, instead of just having people slug it out themselves or use normal weapons, the various people involved have access to weapons based on various classical Chinese elements. Naturally, different types of elements present different potential uses so this does provide a number of interesting battles that are a bit less straight forward than a basic melee would be. At the same time the show does mange to generally avoid uninteresting "stand-and-ki-blast" style encounters. I can't say that Recca himself is that impressive of a fighter as even with his mystical flame abilities he seems to win more by luck or trickery, but I suppose that does match with his desire to be a ninja. Pacing and plot development are fairly decent and don't seem to really go outside what one expects for this type show. I did find most of the initial battles fairly interesting and they did not tend to drag. I must admit being a bit amused when the first main plot arc kicked in just because of its video gamesque pattern of minor challenge followed by an obvious end boss type character. However, I did find I was getting into the initial arc as they slowly (very slowly) began to flesh out the characters a bit more and even added a bit of depth to several of the people that you thought would initially just be throw away encounters for that day. The main characters of this show really don't manage to stray far from their initial archetypal personalities. Thankfully, Recca does slowly become a bit less of cocky brash punk though. Personally, I'll admit to not really caring for that type of character, but I'm sure there are plenty of anime fans out there who will like his determination and gutsy nature. Most of the other character development for the other leads seems to mainly center around the "I have to get stronger so I'll be a better fighter" mantra. While there is a certain basic logic to that in the environment of this show, it makes them a bit uninteresting as characters. Recca's love interest is pretty bland as well. The initially mysterious Kage Houshi is actually the most interesting character in this show. Her actions that seem to alternate between wishing harm on Recca and helping Recca help push forward the plot and as her motivations become clear later, she actually ends up being a very interesting and sympathetic character. Unfortunately as the show progresses, her presence and impact on the plot begins to steadily decline. Though I can say I was honestly enjoying this show when I first began to watch it, at the end of the first story arc, the quality drops rather sharply in my opinion. I'm usually a bit more forgiving of this sort of thing, but there seemed to be a rather noticeable drop in the quality of both the artwork in many scenes and the animation. In an action show that centers around constant fights, it is imperative that, at the minimum, you make sure your fight scenes are animated well. In the beginning of the show I thought they were, later on the situation changed. It also didn't help that past the first major plot arc, the writers apparently got lazy and fell back to one of the most tired and annoying plot cliches in this sort of show: the tournament. I don't mind a few tournaments here and there or a few tournament episode, but not the bulk of the rest of the show! I did stop before viewing the entire show, so perhaps they left the tournament plot arc, but at the rate they were going, it didn't seem likely. It is also my understanding that the show's ending is left rather open. I'll avoid going into plot details in this review, but a large aspect of this tournament involves the main villain sending his second team of super killer underlings after Recca and friends. This was actually kind of amusing in an unintentional way, because the same villain had an entire previous team of just slightly weaker super killer underlings. Maybe he was just supposed to be so ruthless, he liked the idea of getting a group of underlings thrashed instead of sending his top talent to do the job more quickly and efficiently. They try to justify the utter lack of common sense demonstrated by the villain through various plot devices, but it just ended up amusing me rather than convincing me and seemed a bit silly. I don't mind the "leveling" up effect in shows like this, but it helps if they make it a bit less transparent. As for the tournament itself, it is supposed to be different from a normal tournament because it is a dark secret underground tournament. However, everybody seems to know about it whether or not they are tend to run in the kind of circles that would know about dark secret illegal tournaments or not. I found this plot arc extremely contrived and pointless. It felt like the writers simply just ran out of good ideas so they decided to give up on producing any sort of more original or engaging scenario. The tournament arc also totally cheapens the elemental weapons by apparently making them seem about as rare as glass. The fairly good pacing of the initial arc was also lost as fights went from good quick strategic encounters to rather boring multi-episode epics that mainly seem to involve Recca or an associate getting beat on for hours at a time and then suddenly winning at the last minute. Kage Houshi shows up a lot less, which displeased me, because I just had a hard time caring about most of the main cast. Given that the show started only a year after the manga and the manga ran for several years after the show ended (the show ended in 1998, the manga in 2002), I suspect that perhaps the show simply just got a bit ahead of the manga plot line and thus had to lean more on filler episodes and concepts. I can't say this for certain because I haven't read the manga. In any event, the show was decent for a while, then dramatically dropped off in quality. Recommended Audience: Obviously, there is a lot of fighting in this show. It isn't as bloody as it could be, but it does get pretty brutal at times and some of the villains are pretty ruthless, so we do get a few deaths. There are a few brief sexually suggestive situations and a bit of skin shown in a few episodes, but overall I feel this show is safe for teens and above.